Fair warning, this recipe is a beast — it requires all sorts of dried chiles and is best done over two days but it’s worth every ounce of effort. I make the chile sauce and braise the pork shoulder on the first day and make the masa and wrap and steam the tamales on the second day — it makes the entire project a little more manageable. Of course, there are chiles and corn husks to buy (I buy mine at Woodman’s but any grocery store with a decent Mexican section should have most of them) and pork lard to render (or buy) — so maybe add another day onto your timeline if you don’t have these items in your kitchen. The first time I made tamales (blog post here) about six years ago, I remember thinking there is no way I’m going to attempt to make them by myself….the process seemed laborious and complicated. But a few years ago, I decided to give it a go and it was a marginal success (the rolling part is tricky and I had to start over a number of times). Every time I make them, it gets easier — I have a much better handle on the process from making the chile sauce to how to tell when the tamales are done. That old adage practice makes perfect has some truth to it! So, if this is your first crack at making tamales, it may be a little frustrating at first but there are lots of YouTube videos that will fill in the blanks and provide some guidance. We make them a couple of times a year now (for special occasions and the holidays) and always make a huge batch because once the tamales are steamed, you can wrap them up tightly and freeze them. Because let’s be honest — a recipe that requires as much running around and preparation as this one should make enough for a couple of meals! Heat the vegetable oil in a heavy-bottomed stockpot or Dutch oven over medium heat. Add the onion and 3 tablespoons of salt and cook, stirring occasionally, for about 10 minutes, or until the onions are beginning to brown. Add the cumin and coriander and cook for an additional couple of minutes, or until fragrant. Add the chiles and the chicken stock and bring to a boil. 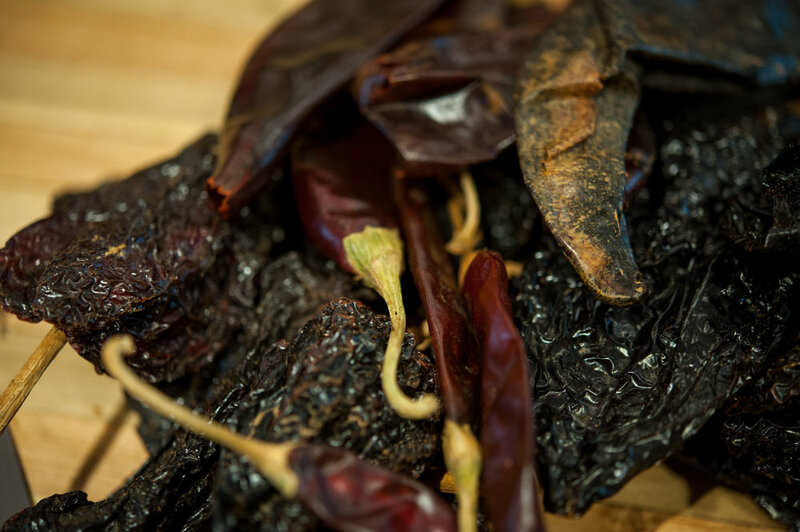 Cover and simmer over low heat, stirring occasionally, for about 30 minutes, or until the chiles are softened. Carefully transfer the chile mixture (in multiple batches) to a blender. Add the garlic and lime juice and puree until smooth, about 2 minutes. You’ll have extra chile sauce and it freezes well for a couple of months. Preheat the oven to 350 degrees. Place the pork shoulder pieces, 2 tablespoons kosher salt, and 4 cups of chile sauce in a Dutch oven. Place in the oven and cook until the pork is very tender and shreds easily, about 2 1/2 hours. Remove pork pieces from the sauce and set aside to cool for about 15 minutes. Skim the fat from the chile sauce and set the sauce aside. Shred the pork, add the reserved chile sauce, and apple cider vinegar, stir to thoroughly combine, place in a covered container, and place in refrigerator for a few hours or until pork is cold. Filling can be made up to three days in advance and kept in refrigerator. Soak the corn husks in a container large enough to cover the husks entirely in hot water (you may need to place something heavy on top of them to keep them submerged) for at least an hour. Place the lard and chicken stock in a saucepan and heat over medium heat, until lard is melted. Place the masa flour, salt, and baking powder in a large bowl, mix to combine, and then add the lard/stock mixture and 1/3 cup of reserved chile mixture. Using a wooden spoon or sturdy spatula, mix the dough until it starts to come together. Place the dough on a masa-covered countertop and knead until the mixture looks smooth and shiny. Take about a 1/4 cup of dough and flatten it into a patty. Place the patty between the palms of your hands and pull them apart; of the patty sticks, add a couple more tablespoons of lard and knead to incorporate. Repeat the test and if the dough doesn't stick, it’s ready. Cover the dough with an inverted bowl on the counter, and let sit for 30 minutes. Drain the husks well; pat dry with paper towels. 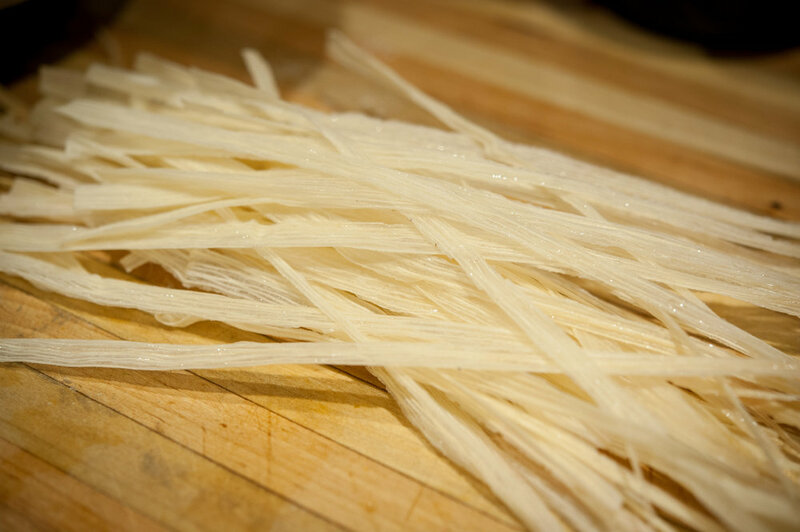 Take about 10 husks and tear them into 1/2 inch strips (you’ll use the strips to secure the tamales). Arrange husk so wide end is closest to you. Spoon 3 heaping tablespoons of masa onto husk a couple of inches from the bottom. Using a spatula or your hands, spread masa into a thin, even layer, covering the width of the husk and about 5" up the length of the husk; leave the narrow end uncovered. If you mess up, just scrape off masa and start over. Repeat with remaining husks and masa. Keeping wide end closest to you, place about 3 tablespoons of the cold pork filling in the center of masa on each husk, forming a log that runs down the center. Fold 1 side of husk over filling, then fold other side over to cover. Holding tamale seam side up, fold narrow, pointed end of husk away from you and under tamale and tie with the corn husk strip. Set on a rimmed baking sheet seam side up. Repeat with remaining tamales. Check out this video at 2:20 for more info on rolling. At this point, the tamales are ready to be steamed. Use a stock pot with wire lining or steamer insert. Add enough water as to keep it below the steamer. Add a few husks to prevent the tamales from getting wet. Tamales must be placed open side up along the inside perimeter of the stock pot. Place extra husks on top the tamales and cover the pot. Steam for about an hour and a half or until the husk peels away from the masa easily.